WEST HOLLYWOOD, Calif. — A Sarah Palin supporter has suffered buyer's remorse after winning an eBay auction for an effigy that was hung by a noose from a West Hollywood home. ChadMichael Morrisette, a professional window dresser who created the Palin look-alike, told the Los Angeles Times the item went for more than $2,200 on Thursday but the buyer has changed his mind. The winner thought he was buying a pro-Palin item and didn't realize the truth until he heard about the auction on talk radio, Morrisette said. 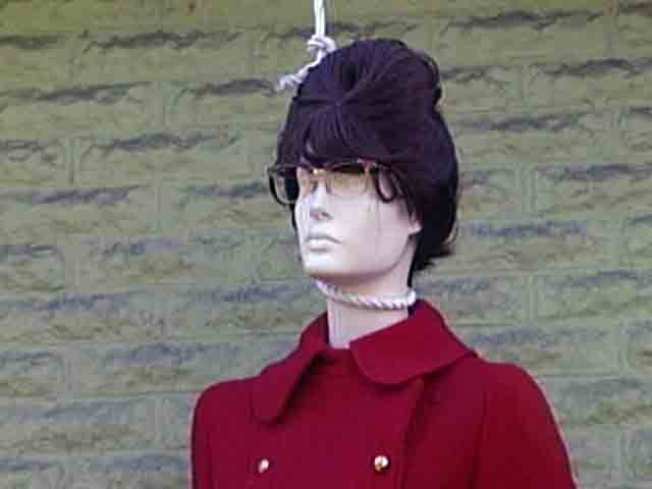 The mannequin of the Republican vice presidential candidate made headlines after Morrisette hung it from the roof as part of a Halloween display last October. The display prompted protests from West Hollywood officials and residents last fall, as reporters from across the nation gathered in front of Morrisette's home for a look at the effigy. Morrisette eventually removed the mannequin just days before the November election citing concerns about possible danger to himself and his neighbors. The first time Morrisette listed the item on eBay this month the auction was canceled because the noose apparently violated the company's ethical guidelines. Morrisette relisted the item with another photo without the noose with a starting bid of $1,000. The listing also included a 4-foot-tall cardboard poster of John McCain's head and the noose. Morrisette hasn't said whether he will put the item back up for auction.